Includes: Shirt with attached vest and sash, pants with attached boot tops and hat. Sword and jewelry not included. Pirate theme night is on its way and so do our pirate costumes collection . Walk like a drunken swagger and show your flailing hand gestures to get a look of trickster pirate. Here comes the fearless pirate with masked motives and a cutlass in his hands. 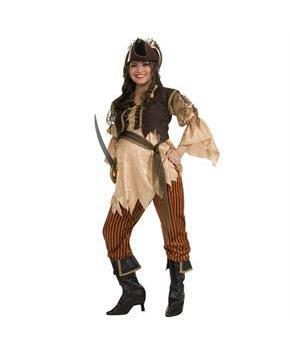 Bring more shine to eyes and dimples on your cheeks with Mommy To Be Pirate Queen Adult costume.